One of the limitations of the new WebExtensions add-on system of the Firefox web browser was up until now that these extensions would not work on some websites operated by Mozilla. Only WebExtensions are hit by the limitation, and it means that functionality that these extensions provide is not available on sites and services such as addons.mozilla.org or www.mozilla.org. Extensions cannot manipulate these pages in any way, for instance to provide additional functionality on them, modify content, or even block elements on them. Load about:config?filter=extensions.webextensions.restrictedDomains in the Firefox address bar. Remove one, some or all of the domains listed under value to remove the restriction. Mozilla added a new -- hidden -- preference to Firefox 57 that you can set to do away with the limitation in the Firefox web browser. Hidden preferences are those that are not visible by default when you open the about:config page of the web browser. They do exist, but you do need to know them to set them in the browser. The hidden Firefox preference privacy.resistFingerprinting.block_mozAddonManager removes the WebExtensions restriction. Load about:config in the Firefox web browser. You can run a search for privacy.resistFingerprinting.block_mozAddonManager just to make sure it does not exist. It does not in the most recent Firefox Nightly builds at the time of writing. Right-click in the part of the window that lists the preferences, and select New > Boolean from the context menu. Name the new Boolean value privacy.resistFingerprinting.block_mozAddonManager. A value of true means that WebExtensions work normally on Mozilla's website. You can undo the change at any time by setting the preference to false on the about:config page of the browser. 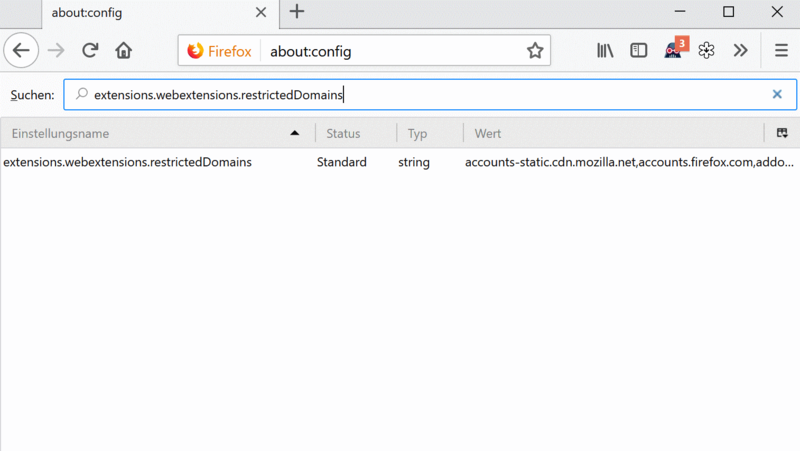 Find out how to enable WebExtensions access to mozilla.org websites in the Firefox web browser (Firefox 57 or newer required). It was added for the Tor browser uplift. I hope Mozilla do not close this loophole. The protected about pages is not an issue (for me) since I block activity stream etc, and I do not use (and indeed hide) the get addons panel – so this closes all the GA BS’ery once and for all. Do you, any anybody else, understand why this is categorized under ‘privacy.resistFingerprinting’? >In Tor Browser, to protect against fingerprinting, we block window.navigator.mozAddonManager data from being exposed to AMO. We would like to propose uplifting this protection behind the “privacy.resistFingerprinting” pref. So, wait, it’s concern that info is being exposed to AMO? If you’re okay with data being exposed to AMO (and only AMO) is there any harm in enabling this pref? AMO respects Do Not Track. If you go there with DNT enabled you don’t need to have anti-fingerprinting measures on Mozilla sites. I tend not to use DNT, so I am happy that this pref is implemented into Firefox 57. To be honest I didn’t believe there wouldn’t be such a pref by at least 58. Aren’t special rights being discussed ? I think I saw something like that, where for instance uBO would be able to control another add-on. When I read that on Bugzilla, I couldn’t be certain that my understanding was correct. On top of that it was a couple months ago and my memory could be failing me. But I’ve got some vague hope lingering since then. Read it. Confused. Outside of a rogue extension modifying AMO, is there any risk? From what I understand, as long as you read UI prompts properly, you’re safe even if a rogue extension that you installed modifies AMO. But if you have a rogue extension you really have other problems than having it trick you into installing another rogue extension. Great! It also works for Firefox Screenshots. Is there a pref. like this to make extensions work on internal pages, like about:addons and about:newtab? Okay. So how do I defeat this “security” feature on FF56? Is there a way to remove the restricted on Internal About Page too? e.g. About:Config or About:Addons. Not sure about that, maybe some very savvy folks know how to do it, but it hasn’t been shared so far. A quick Google search shows that you now also have to edit the “extensions.webextensions.restrictedDomains” option to remove the domains you want to use WebExtensions for. I’ve just changed the option so it is blank and that fixes the problem for me. This doesn’t appear to work anymore in Firefox 60. Thanks, very useful! Does exists any ways to enable WebExtensions in Firefox in new tab, about:*, error pages, etc? This is very needed for Mouse Gestures extensions. The extension imagus is not working again on AMO and when i click on uBlock Origin’s Element Zapper or Element Picker on AMO i get a weird pop up at the top left which i’ve never seen on any other website. i will restart Firefox and retest it soon. i’ll come back and update my findings. Restarting Firefox made no difference.